Buddhism believes in the existence of neither God nor soul in the theistic sense. It is essentially a religion of the mind, which advocates present moment awareness, inner purity, ethical conduct, freedom from the problem of change, impermanence and suffering, and reliance upon one's own experience and discernment on the Eightfold path as the teacher and guide, rather than an external authority other than the Dhamma. One may take guidance from a teacher, but insightful awareness and experiential knowledge of the Dhamma are vital to progress on the path. Unlike the other major religions of the world, Buddhism is not centered on the concept of God as the upholder and sum of all or a universal supreme being, who is responsible for the creation and dissolution of the world and the existence of sentient beings. Buddhism does not even support the idea of an eternal and unchanging soul residing in the body. According to Buddhism the whole existence is in a state of flux, and there is nothing that is either permanent or unchanging. Some things may last longer, but never forever. The Buddhist scriptures do confirm the existence of devas or celestial beings, bodhisattvas or pure beings, heavens and hells and other planes of existence. They may last for eons. However, none of them are permanent entities. They are all subject to change, impermanence and evolution. It is said that the Buddha either remained silent or discouraged speculation when he was asked questions about the existence of God or a Supreme Being. The Buddha did so with a purpose. He wanted his followers to remain focused upon Nirvana and the permanent resolution of suffering, without distractions and wasteful discussions. Therefore, he did his best to keep them focused upon that single and virtuous goal, without becoming distracted by theological speculation or intellectual disputation, which was the common preoccupation of many scholars and religious teachers of his time. However, his silence does not mean that he was an agnostic or he favored the notion of God as the ruler and creator of the worlds and beings. His silence was not an affirmation of the existence of an eternal creator. The Buddha did not believe in hidden causes but apparent causes, which made sense to the mind and the intellect and which were humanly relatable, experiential and explicable. One may wonder if it was so, why he accepted karma and reincarnation as governing laws, which were in some respects abstract concepts. Karma was a hidden process of cause and effect, but with mindfulness practice its working could be discerned and experienced in the world by one and all. No supernatural testimony was required to establish its universality or working. Therefore, he accepted karma as an operating principle. He believed in reincarnation because he saw his own past lives (and probably those of others) in contemplative states and understood their significance in attaining the Buddhahood. However, he held that the incarnating entity was not an eternal soul but a temporary formation. 1. If God is indeed the creator of all living things, then all things here should submit to his power unquestioningly. Like the vessels produced by a potter, they should remain without any individuality of their own. If that is so, how can there be an opportunity for anyone to practice virtue? 2. If this world is indeed created by God, then there should be no sorrow or calamity or evil in this world and no need for the existence of the principle of karma since all deeds, both pure and impure, must come from Him. 3. If it is not so, then there must be some other cause besides God which is behind him, in which case He would not be self-existent. 4. It is not convincing that the Absolute has created us, because that which is absolute cannot be a cause. All things here arise from different causes. Then can we can say that the Absolute is the cause of all things alike? If the Absolute is pervading them, then certainly It is not their creator. 5. If we consider the Self as the maker, why did it not make things pleasant? Why and how should it create so much sorrow and suffering for itself? 6. It is neither God nor the self nor some causeless chance which creates us. It is our deeds which produce both good and bad results according to the law of causation. 7. We should therefore "abandon the heresy of worshipping God and of praying to him. We should stop all speculation and vain talk about such matters and practice good so that good may result from our good deeds. For such reasons, the Buddha did not encourage speculation on the existence of Isvara, (God) among his disciples. He wanted them to confine themselves to what was within their field of awareness, that is, to understand the causes of suffering and work for their mitigation. For the same reason, he discouraged speculation upon the nature of Nirvana. He preached that initially each being was a product of ignorance and illusion and subject to suffering, karma and transmigration. Life was full of suffering and it could be resolved only by overcoming desires and attraction and aversion. The Dhamma served as the lamp in the darkness of existential suffering. By knowing it and practising it one could find a way to escape from the cycle of births and deaths and from suffering itself. Therefore, for their final liberation he urged his disciples to contemplate upon the Four Noble Truths, practice the Eightfold path and lead a virtuous life by performing good deeds. He declared that by ending the transient states of having, becoming, being and changing and removing the defilements of the mind and body they could resolve suffering and enter the state of beatitude or Nirvana on a lasting basis. Thus, in Buddhism knowledge of the Dhamma has far greater significance than idle speculation in resolving suffering. One may inquire into it and contemplate upon it since it is experiential, relatable and verifiable, unlike the speculative subjects such as the nature of God or the existence of God and soul. It is difficult to categorize Buddhism as atheistic, theistic or agnostic because it has aspects of them but does not particularly fit well into any of them. For example, Buddhism may not believe in God and may not be considered a theistic tradition, but it does believe in the Buddha and the Buddhahood. Indeed, it not only believes in the Buddha but also in numerous past and future Buddhas who exist in numerous higher worlds. Buddhists worship them with devotion and reverence and make them offerings just as the Hindus worship their gods. Thus, as explained in the concluding part of this discussion, Buddhism is a diverse religion, with elements of theistic, atheistic and agnostic beliefs and practices. However, it cannot conclusively be placed in any of them with enough justification because of its inherent contradictions. Although it was founded by the Buddha and its teachings are more organized, concrete and systematic, Buddhism, just as Hinduism, is a complex religion. It underwent further changes after his death, resulting in the formation of many sects, sub-sects and regional versions, which made it even more complex. Some of them made a radical departure from the original teachings of the Buddha to the extent that they stand in their own light as independent religions. Were he alive, the Buddha would have been surprised to witness the emergence of so many traditions that rely upon his name to mark their teachings and philosophy but show a marked deviation from his very teachings, doctrinal expositions and stand points. What mostly binds them to Buddhism and keeps them in its fold is their adherence to the Four Noble Truths and the Eightfold Path. While scholars may keep arguing about the essential nature of Buddhism it is the firm opinion of this writer that according to the teachings of the Buddha it is difficult to place Buddhism on the same footing as Hinduism or Christianity and consider it a theistic tradition. It is theistic only in the sense that some of its sects (especially those of Mahayana) believe in a deity, the Buddha, who is not God but seem to possess some attributes of God. The Buddha did not ascribe any role to God either in creation or in human suffering or in the liberation of beings. For the Buddha, the world was a godless world, a formation or aggregate of objects and living beings, in which both good and evil were produced by the actions of individual beings, and their fate was determined by the law of causation (karma). While beings which lacked intelligence had no choice until they evolved through rebirths, human beings and those above them had a unique opportunity to exercise their discerning intellect (buddhi) and chose right actions and the principles of right living to escape from the law of karma and the cycle of births and deaths. Therefore, to awaken their minds to the idea of righteous living and virtuous actions, he taught the world the Four Noble Truths and the Eightfold Path, ascribing no role to God in either of them and putting the entire burden of resolving individual suffering upon the individuals themselves. In Buddhism, there is nothing like the grace of God which can resolve the karma of a devotee. An arhant (enlightened master) or a selfless monk may transfer his good karma to a suffering soul out of compassion, as believed in some sects, but such decisions are purely personal in which neither God nor Buddha has any role. While drawing his conclusions and formulating the principles of Dharma and the Code of Conduct (Vinaya) for the monks or in his teachings, the Buddha assiduously avoided to the extent possible all manners of speculation about supernatural matters and abstract concepts, keeping his focus firmly fixed upon the causes as well as solutions to the problems of human existence within the realm of the mind and its abilities, and without alluding to anything beyond them. If he had any opinions or knowledge about transcendence or eternal realities, he kept them out of the purview of his discussion and deliberations to avoid causing confusion and delusion. Even when he was pressed for a clear answer, he remained silent, knowing that it would be a distraction for his followers in their quest for Nirvana, and for himself in his attempts to show them the right way and teach them the right knowledge. Besides, speculation would not lead to right perception, right awareness, right understanding and right knowledge. While Buddhism does not believe in the existence of an all pervading eternal God who is the cause of the causes and the soul of the souls, it does believe in the existence of Noble beings or gods of heaven. The Buddhist texts mention the names of several gods and goddesses, whose names are similar in many cases to those of the gods and goddesses of Hinduism. However, while the deities of Hinduism are immortal, those of Buddhism are not. They live for longer duration of time, but like all other beings, they are prone to decay and subject to the cycle of births and deaths. They may be even humans who evolve into gods through self-effort. Some of the gods whose names ​frequently appear in the Buddhist Pantheon are Brahma, Indra, Aapo (Varuna), Vayo (Vayu), Tejo (Agni), Surya, Pajapati (Prajapati), Soma, Yasa, Venhu (Vishnu), Mahadeva (Siva), Vijja (Saraswati), Usha, Pathavi (Prithvi), Sri (Lakshmi), Yama, Kala, Kuvera (Kubera), and Garuda. The texts also refer to the existence of celestial beings such as yakkhas (Yakshas), gandhabbas (Gandharvas), Nāgas, and demons such as Bali and his sons, Veroca, etc. Brahma figures frequently in Pali Canon, which refers to not one but several Brahmas inhabiting different planes. Brahma is the leader of the heaven. However, he is not a creator god, and in all the worlds where he presides he is also subject to change and decay as the other gods. Apart from them, Mahayana Buddhism refers to the Bodhisattvas or compassionate beings and primordial Buddhas who inhabit the higher heavens and act as the guardians of the world. The Bodhisattvas are truth beings, who are fully qualified for Nirvana. However, out of compassion they decide to postpone their liberation and work for alleviating the suffering of the sentient beings upon earth. The primordial Buddhas such as Samantabhadra, Vajradhara, Vairochana, and Adi-Buddha among others are personalized embodiments of different aspects of Buddha Nature. They are pure beings who possess dharmakayas (bodies of truth). The gods of Buddhism have greater powers than humans, but unlike the gods of Hinduism, they do not possess absolute powers. They can have an impact upon our lives and destinies, but they cannot change or alter the course of life upon earth beyond a point. Besides, the gods are not liberated beings. Their actions have consequences. Hence, just as humans they too are subject to the law of karma. If they indulge in wrong actions, they will fall down from heaven into lower worlds according to their deeds. However, the same is not true in case of the primordial Buddhas. They are not only free from decay and the law of karma but also endowed with supernatural powers. According to Buddhism life in heaven is not a class privilege, which only a few chosen ones are entitled to enjoy according to the will or at the pleasure of God. The gods are not created by a supreme God. They are self-made. Their divinity is the consequences of their good karma and their personal choice. Beings evolve through self-effort and good karma and earn the right to enter the world of gods. In other words, anyone can be reborn in the worlds of gods through righteous self-effort and become a divinity. Although it is not encouraged, Buddhism does not rule out the possibility of humans taking birth in the world of gods and gods, having lost their virtue and due to bad karma, taking birth in our world. Since life in heaven is equally conducive to suffering, Buddhists aim for liberation rather than rebirth in the heavens. The origin of Buddhism is rooted in the ascetic and monastic traditions of ancient India. The Buddha did not advise the monks to indulge in ritual worship or venerate him or other beings with devotion. However, a few centuries after his death, a schism in Buddhism led to the formation of Mahayana sect of Buddhism, which made a radical departure from the traditional teachings of the Theravada or Hinayana Buddhism and projected ritual worship of venerable Buddha in his highest and purest aspect as worthy of worship and devotion. The Mahayana tradition supports the worship of Buddha to cultivate virtues, practice love and compassion and receive enlightenment. The purpose of worship in Buddhism seems to be to enable the worshippers to form a clear concept of the ideal of Buddhahood and understand the Buddha nature rather than seeking his grace or intervention in their personal lives for the alleviation of their suffering. Buddhism is primarily a monastic and ascetic religion, which shares some aspects of theism with Hinduism and some aspects of atheism with Jainism. Yet, you cannot say it is a cross between the two. It is a unique tradition in its own right. It adapted the theistic practices of Hinduism mostly in the context of its own teachings and for the ultimate purpose of putting the onus of attaining Nirvana entirely upon individual effort rather than upon divine intervention or the grace of God. While in Hinduism, the householders may pursue the four chief aims life (Purusharthas) namely Dharma (the law), Artha (wealth), Kama (pleasure) and Moksha (liberation), in Buddhism the lay followers as well as the monks aim for only two namely the practice of Dharma (Dhamma) and the attainment of Moksha (or Nirvana). In ancient India, atheists such as the Lokayatas and Charvakas also believed in the nonexistence of God. At the same time, they did not believe in the possibility of life after death. For them, death itself was Nirvana. Hence, they ignored both Dharma and Moksha and focused only upon the other two aims namely Artha and Kama. They considered life a unique opportunity to strive for happiness while it lasted, since death the end of all. They saw no greater virtue or justification to suffer here and now for the sake of a better life in the next birth or enjoyment in a heaven. 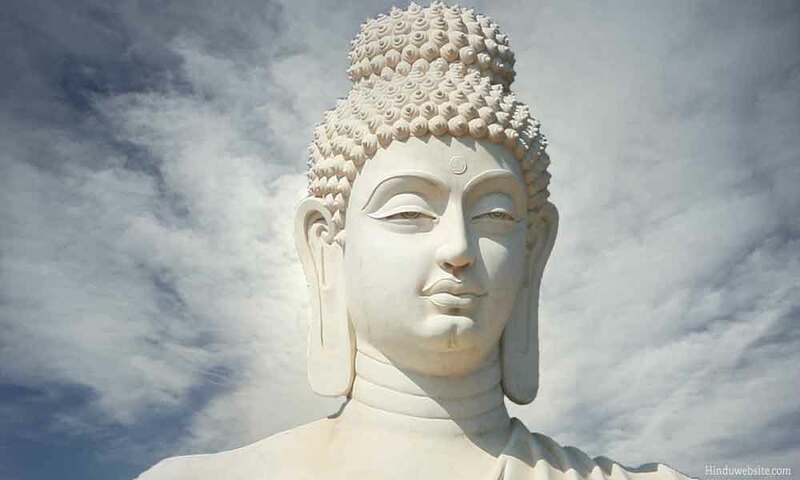 Thus, even in comparison to atheistic traditions of ancient India, Buddhism retains its distinct character as a spiritual religion which can be categorized neither as theistic just as Hinduism nor as atheistic just as the Carvaka or the Lokayata doctrines. It is a tradition which is uniquely human, intellectual, practical and which is principally rooted in verifiable, relatable and perceptual human experience.